The microFollowFocus | Blue is a new generation of follow focus units that lead the way in price/performance. The | Blue line incorporates new designs and technologies to deliver an incredibly solid, accurate, highly repeatable follow focus ideal for any level of production. The microFollowFocus | Blue can be used with still lenses (with proper gearing such as our microLensGears) and cinema lenses. 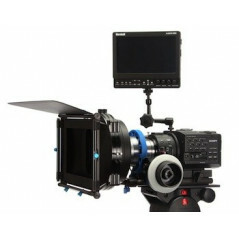 Performance is the most critical aspect of any follow focus unit. At the heart of the microFollowFocus | Blue is a Redrock custom designed and manufactured gearbox that produces exceptionally smooth, backlash-free focus pulls. Unique adjustments for backlash and drag allow you to dial in exactly the feel and performance you want. The microFollowFocus | Blue incorporates the best of the award-winning innovations from the microFollowFocus v2, including the original Redrock 3D marking disk, convenient quick release clamp, and large precision-machined focus wheel. Building on this solid foundation, the microFollowFocus | Blue adds a refined slim design, adjustable hard stops, reinforced moveable focus indicator, flippable gearbox, all-metal machined accessory port, and a unique illuminated marking disk (when used with optional Flares). The microFollowFocus | Blue comes in two configurations: A single-sided version and a double-sided (studio) version. The only follow focus that allows you to add a second wheel on the opposite side which speeds up repositioning. You can switch between single or double-sided setups, or add the second wheel option at any time.